MainAll NewsInside IsraelWho Will Win in the Likud Primaries? Who Will Win in the Likud Primaries? 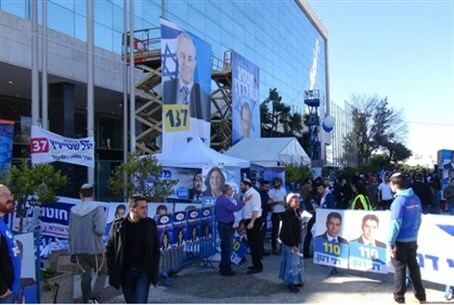 Polls closed 10 p.m. Wednesday with 55% of Likud members participating; as of 9:30 a.m. Thursday 40% of the votes had been counted. At 10:00 p.m. Wednesday night, 600 ballot boxes at 115 sites across Israel closed, marking the conclusion of primary elections for the Likud party. Results are expected to be made public later on Thuesday. As of 6:00 a.m., Walla! News reported, 20% of the ballots had been counted. That number rose to 40% at 9:30 a.m. The rate of participation by Likud Central Committee members in the primaries was 55%, a significant drop from the previous Likud primary, before the January 2013 Knesset elections, in which the the rate was 63% - although that primary featured two days of voting . Primaries for elections in 2008, which also took place over only one day, had a much lower participation level compared with Wednesday. Until 9:30 p.m. Wednesday night, Likud officials discussed extending the voting, due to the relatively low turnout, but in the end decided to keep the end time of 10:00 p.m. set in place. The task of counting the ballots continues and estimates say that official results should become known sometime Thursday morning due to the fact that the votes are being counted manually and not by computer. Likud Central Committee members voted on three issues: The identity of the leader of the party, the party’s list for the general elections, and Netanyahu’s request to be allowed to reserve two spots on the party’s list for candidates of his choice. Netanyahu will hold a press conference at 11:00 a.m. at Metzudat Ze'ev, Likud's headquarters in Tel Aviv, where he is expected to discuss primary results and his own victory. Danon quickly conceded defeat to Netanyahu and offered the Prime Minister his congratulations. “From the emerging results, Prime Minister Binyamin Netanyahu won the election,” Danon said in a statement. "I congratulate the Prime Minister and wish him well. We will work together to bring the Likud to a victory in the general election." "I'm going to call the Prime Minister, congratulate him on his victory, and starting tomorrow we will work hard so the Likud will form a nationalist government without [Tzipi] Livni and [Yitzhak] Herzog," said Danon. As for predictions of the Likud's party list for general elections, as of now, MKs Gilad Erdan, followed by Yuli Edelstein, Yisrael Katz, Yariv Levin and Silvan Shalom are leading. Moshe Ya'alon is not far behind, while Moshe Feiglin appears off the list. MK Miri Regev is also expected to upgrade her status and the become the top woman in Liud. However, on Sunday, during an interview with Channel 2, Regev made the controversial remark that if Netanyahu does not appoint her a ministerial position in the next government she will "make a coup." A senior party official responded to Regev's comments Tuesday, saying, "in the Likud, we do not like such talk against the Prime Minister. It is a great goal, and Regev will do very well in any case, but no doubt these remarks may cause her harm." It also appears that Likud Central Committee members approved Netanyahu's request to reserve the 11th and 23rd seats on the list in favor of candidates of his choosing.